The beer gods must be appeased, so once a year we gather to make a coconut sacrifice to celebrate life’s two greatest joys – beer and dessert – which mystically come together in Death by Coconut Irish Porter. Bittersweet cacao and creamy coconut are intertwined in this rich, delightfully dessert-y porter. Join the cult and help us celebrate the 2018 release of Death by Coconut Irish Porter – taking over taprooms on October 5. Don’t worry, we won’t wash your brains or make you wear an unflattering shade of orange – the only initiation ritual is grabbing a 4-pack of Death by Coconut, a 6.5% ABV winter seasonal. The beer was originally brewed in collaboration with Shamrock Brewing in 2014 and went on to earn a silver medal at GABF in the chocolate beer category. 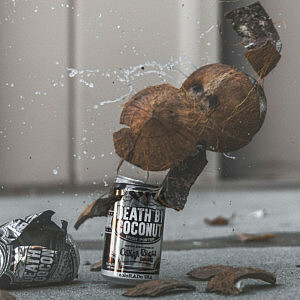 Death by Coconut is now a yearly seasonal that’s made on a much larger scale than the 2014 batch; and consequently the brewing process has changed since the days when Juice’s predecessor, Jason Buehler, was piloting the beer in Lyons. Making more of the beer required innovation on the brewers’ part. One important factor was determining what type of chocolate to use and where to source it from, since adding chocolate (and solid ingredients in general) to a beer can present issues like clogging and instability. Boulder-based Cholaca provided the answer to the chocolate dilemma. Cholaca makes pure liquid cacao containing only three ingredients: water, cacao and coconut sugar. The product allows brewers to give beer a rich, smooth chocolate taste by adding liquid chocolate (cacao emulsified in water) rather than trying to extract chocolate flavor from cacao nibs or powders. Plus, the cacao is sourced directly from farmers and co-ops in Ecuador that utilize regenerative farming practices. “Now Cholaca is in over 700 breweries, in 50 states including Canada, in 15 countries, including Australia. That volume gives us the ability to import quality cacao. It helps us get the great stuff,” said Cholaca founder Ira Leibtag. “Without the great stuff, we end up with GMO and preservative-infiltrated product… and ruined rainforests.” At Oskar Blues, we’re stoked to make Death by Coconut with help from a conscientious company that makes the best liquid cacao product around. Can’t make it to a release shindig? Don’t worry – Death by Coconut will be distributed nationally in 4-packs of 12oz cans. Use the beerfinder to find it on shelves near you.